Check out my new equipment- a mini humidifier! Porcelain is notorious for drying quickly, and with my pots taking up to 100 hours to carve, keeping them leatherhard is a real challenge for me. 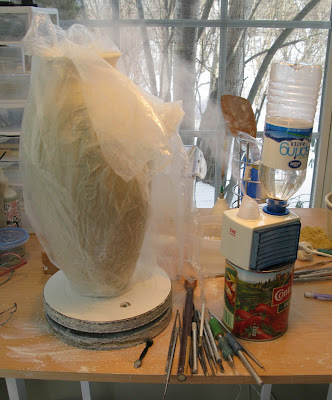 Up until now I have relied on covering with plastic and constant gentle misting to keep them workable. I just found this little humidifier at CVS. That is it sitting on the can of tomatoes. I love it! I can direct the mist right on the exposed area that I am working on. Technology!